Emma was a newspaper journalist in Devon and Cornwall before becoming a full time author. 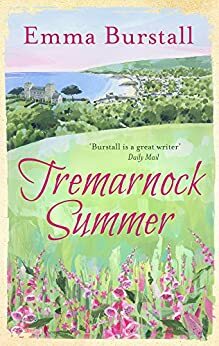 Tremarnock, the first novel in her series set in a delightful Cornish village was published in 2015 and became a top 10 bestseller. This is the third instalment in Emma’s heartwarming series, set in a Cornish seaside village of Tremarnock. Bramble Challoner has had a very normal upbringing. She lives in a semi in the suburbs of London with her parents and works in a call centre down the road. She still goes out with the boy she met at school. At weekends they stay in and watch films on the telly and sometimes holds hands. Bramble is dying for an adventure. So, when her very grand grandfather, Lord Penrose dies, leaving his huge rambling house in Cornwall to her, Bramble packs her bags immediately, dragging along her best friend, Katie. The sleepy village of Tremarnock had better be ready for its newest residents….. I have not read any of the other books by Emma, but don’t worry this is not a disadvantage at all. This is the type of book that it is difficult to review as I do not want to give too much away with what happens with the different story lines within the village. But, what I can say is you see Bramble really grows up and becomes her own individual and incredibly independent throughout the story. Bramble is fighting with her old and new life and you go on the journey with her when she decides what she wants to keep from her old life and bring into her new life. Everyone around her is negative about her moving to Cornwall and general change but Bramble fights against this. You will have to read the book to see whether she is successful. What I loved was she was told many stories, negative about her family but she didn’t give up and sought the truth from others who knew her grandfather and in the end you can feel her love and bond with her grandfather despite her never actually meeting him. I felt there was a small amount of sorrow that she never actually met him, but she tried to do everything to make him proud. The story is typically reflects village life and I recognised the many different people, as I used to live in a village. The story shows how new people have to transition into village life and whether the villagers really accept them as part of the community. Emma transports you into the village and your a bystanding watching all of the stories unfold before your eyes. I cannot wait for the next instalement which is due Summer 2018. A copy of the book is available here.